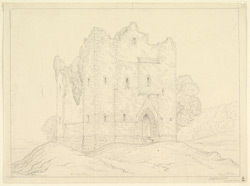 Drawing of the keep of Hopton Castle in Shropshire. It is located in the far south west corner of Shropshire, very near the borders with Wales. This great rectangular keep dates from the Norman period. It is built on the motte (mound) and surrounded by a moat. The castle held a Parliamentary garrison but was captured by the Royalists in the Civil War. The garrison were killed and the castle was heavily damaged and left abandoned However part of the formidable keep survived and is still standing today.